Love's opened several new locations in June, including one in Las Vegas, N.M., in the northeast area of the state. Love's Travel Stops is now serving customers at new travel stops in Florida, New Mexico and North Carolina. Three new stores opened June 7 in Ellisville, Fla., at Interstate 75 and Exit 441; and Statesville, N.C., at Interstate 40, Exit 154. The Milan, N.M., store, located near Interstate 40, Exit 79, reopened after a total store rebuild with 30 additional truck parking spots. Love's also completed a parking addition project at its Tulare, Calif., location which added 53 new truck parking spots to the store. In total, the stores add more than 300 truck parking spaces. The three new stores feature a variety of restaurant options such as Chester's, Hardee's, McDonald's, Subway and Godfather's Pizza. The reopened location in Milan adds laundry facilities, increased restaurant seating and new showers. The Ellisville and Statesville locations offer Love's Truck Tire Care services, showers and all the new amenities and products expected at new Love's locations. Three weeks later, the retailer opened another location in New Mexico, this time in Las Vegas. 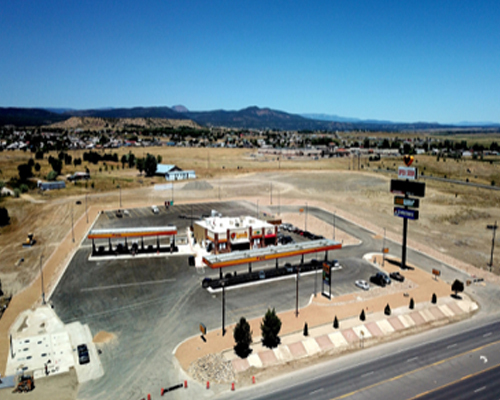 The store, located at the intersection of Interstate 25 and North Grand Avenue, opened its doors on June 28. The more than 6,000-square-foot facility features Subway and Chester's Chicken restaurants, as well as brand-name snacks, gourmet coffee, fresh-to-go options, fountain drinks, and electronics. Professional drivers can take advantage of 32 truck-parking spots, four showers and laundry facilities. Pilot Flying J opened four Pilot Travel Centers in June. The new sites welcomed customers in Bunkie, La. ; Cedar Rapids, Iowa; Monument, Colo.; and Hempstead, Texas. In all, the travel centers add 205 truck parking spaces and approximately 220 local jobs. Pilot Travel Center, Bunkie, La. Pilot Travel Center, Monument, Colo. The new facilities will bring Pilot Flying J's network of stores in Louisiana to 11 locations; Iowa to 18 locations; Colorado to six locations; and Texas to 77 locations. Cumulatively, the new travel centers are expected to contribute $11.4 million annually in state and local tax revenues and will grow Pilot Flying J's footprint to 791 locations. Pump-N-Go's parent company is building up its 15-store chain. Pump-N-Go, a division of Stature Investments, broke ground on two new locations: 2 Magnolia Blvd. in Port Wentworth, Ga., and 4820 Augusta Road in Garden City, Ga. The new Port Wentworth location will feature approximately 4,000 square feet of c-store space and 8,400 square feet of retail space. The Garden City location will feature approximately 3,500 square feet of c-store space and 6,000 square feet of retail space. Both locations will include a modern design with high-end finishes and appointments, as well as well-lit parking lots. "Currently, we're operating 15 locations under the Pump-N-Go brand with plans to add additional stores over the next six months," said Yash Desai, president and chief operating officer of Stature Investments. "We are customizing our new stores with a modern approach to design and staying on trend with popular product offerings that are important to our customers. We're very excited to grow the Pump-N-Go brand and building lasting customer relationships as we go." The new locations are expected to be complete by fourth quarter. 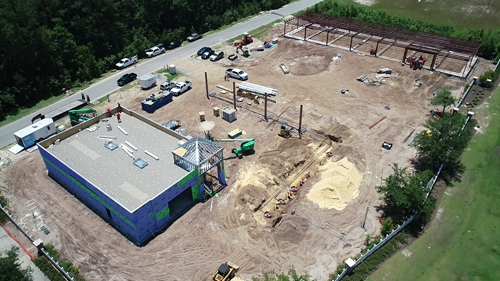 South Coast Contracting Group Inc., headquartered in Pooler, Ga., is serving as general contractor for the new Pump-N-Go locations. QuickChek is expanding its appeal to millennial consumers with a new convenience store in Hackensack, N.J. The location, which opened its doors on June 26, offers no-fee ATM, free Wi-Fi, indoor seating for 10 and outdoor seating for eight, 10 fueling positions and 36 parking spaces. Other features at the latest QuickChek include freshly made grab-and-go food and market items, fresh backed good made on site, a standalone soup station, and a new foodservice menu with handcrafted subs and original recipe sandwiches. "We feel this new store design provides a better showcase for our high-quality, great tasting fresh food and beverage menu items as we continue to meet the ever-changing shopping and dining habits of today's consumer," said QuickChek CEO Dean Durling. Pennsylvania's capital has a new Sheetz. The convenience retailer built up its presence around Harrisburg with a newly opened convenience store in East Hanover Township. The 24-hour location measures 5,490 square feet and features inside and outside seating, a beer cave, and 12 fuel pumps. The TA Restaurant Group (TARG), a division of TravelCenters of America LLC, cut the ribbon on its third Black Bear Diner, located at U.S. Route 36 (Church Ranch Boulevard) in Westminster, Colo. The full service dining concept offers home-style meals that reflect the brand's small-town roots, including comfort food classics like chicken fried steak, corned beef hash and slow-cooked pot roast. The diner also features a wide selection of dessert favorites such as apple cobbler and chocolate cream pie. All Black Bear Diner restaurants display a log cabin, bear-themed atmosphere and are designed to remind guests that quality and service are key ingredients to every meal. "It's essential to us to meet the ever-changing needs of our customers. As we open yet another sit-down, full-service restaurant in our network, we are excited to offer the traveling motorist and local public a place where they can sit, relax and enjoy a satisfying, home cooked meal and a family-friendly atmosphere," said John Ponczoch, senior vice president of TravelCenters of America's and leader of the TA Restaurant Group. The restaurant has seating for 216 guests and is open daily from 6:00 a.m. to 10:00 p.m. A party room is available for larger groups and celebrations. In addition, TARG's Quaker Steak & Lube signed a development agreement Robert Berkstresser, owner of the Petro Stopping Centers/White's Travel Center located at I-81/I-64, exit 205, in Rockbridge County, Va.
Berkstresser plans to break ground on the 5,000-square-foot, full-service restaurant in the fall, with a planned opening in spring 2019. The new Quaker Steak & Lube is slated to have seating for 180 in the bar and dining room, with an additional 60 to 70 seats on the patio. The Quaker Steak & Lube will be the brand's third restaurant in Virginia. This is the first franchise agreement since TravelCenters of America bought the Quaker Steak & Lube brand in 2016. TravelCenters has opened two Quaker Steak & Lube restaurants, which are owned by the company, since the acquisition. There are 46 Quaker Steak & Lube restaurants operating nationally as standalone restaurants, as well as in airports, arenas and universities. TravelCenters owns and operates 16 of these restaurants, while the remaining are franchised locations.